Nine native Andean root and tuber crops hold economic and nutritional importance for subsistence farmers in the Andes. These lesser-known roots and tubers offer high vitamin, micronutrient, and starch content; good yields, and various medicinal properties. As a result, they also hold potential for further research, adaptation and use in other regions of the world, and exportation. The crops are known by their Quechua Indian names: achira, ahipa, arracacha, maca, mashua, mauka, oca, ulluco, and yacon. 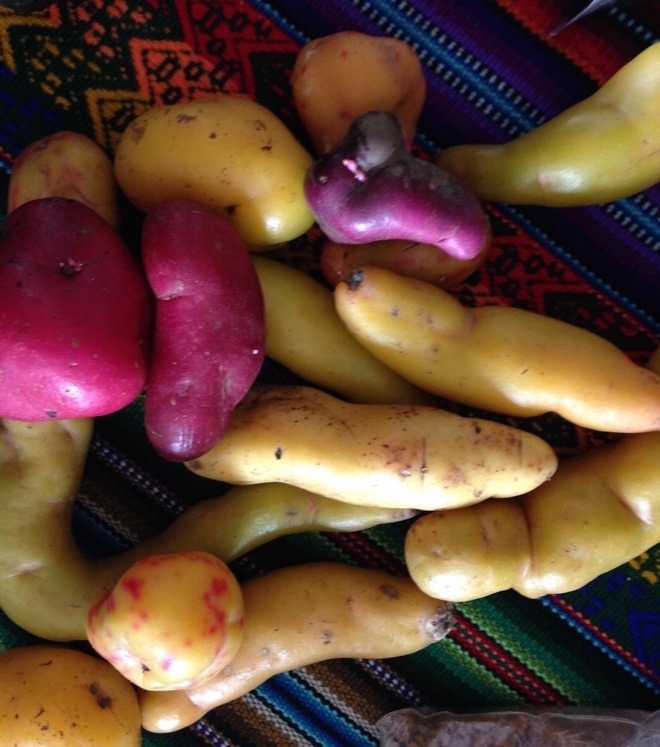 The International Potato Center protects and maintains the remarkable genetic diversity of wild and domestic Andean root and tuber crops threatened by extinction or genetic weakening. The genebank contains some 1,500 accessions collected from seven countries. The perennial achira is from the same family that produces the exuberant, showy canna lilies found in florist shops and gardens worldwide. Also known as edible canna or Queensland arrowroot, it was a staple food for ancient Peruvians. Flowers range in color from red to yellowish orange. There are 30–60 species in America and Asia, most of which produce fleshy, starchy rhizomes but with variable success. The seeds need scarification (softening the seed coat either physically or by chemical means) so that they absorb water more easily to germinate. The fleshy rhizomes are traditionally baked in earthen ovens, and also used to produce a starchy flour for cooking breads and biscuits, and thickening drinks and soups. Achira root has the largest starch granules ever determined in a vegetable; visible to the naked eye. The particular composition of this high-value starch enables it to be extracted easily and economically using homemade equipment. It is this industrial starch that provides an important source of income for Andean communities, where in some villages it is the main cash crop. Achira is gaining wide popularity in Colombia, where there is growing demand for biscuits made from the root. In Vietnam, about 30,000 hectares are planted for prize gourmet noodles. Scientists had thought that this colorful root had all but disappeared. Although the species has been described since 1794, it remained in obscurity until 1965, when it was rediscovered in a remote rural community in Bolivia. Few fields remain and virtually no scientific studies have been carried out on the crop, which reproduces easily through seeds and is amenable to classical plant breeding. High in protein, calcium, and phosphorous, mauka provides an abundance of succulent, edible stems. The roots are preferably cooked and eaten after several days of exposure to sunlight, a treatment that lessens the slightly bitter taste they have when freshly harvested. Harvested roots are also sometimes placed in the ground for a week to concentrate their sugar content.